The nine-year-old Room actor hammed it up on the red carpet and geeked out over Star Wars, much to the delight of the internet. Mad Max, Leonardo Di Caprio and Spotlight might have won big at the Oscars on Sunday, but it was pint-sized Jacob Tremblay who stole the show. Here are some of the adorable moments that show just how really cute the nine-year-old Vancouver actor is. The Room actor put up this photo of him in the back seat as his parents drove him to the Oscars venue in Los Angeles. 2. "I can see a lot of legs"
When Ryan Seacrest asked Tremblay for his perspective on the red carpet, he responded without missing a beat: "I can see a lot of legs." ​The Canadian actor is a huge Star Wars fan. He embellished his Armani suit with Millennium Falcon cufflinks and Star Wars socks. And though he's normally the picture of composure and charm, Tremblay got very excited when BB-8, R2-D2, and C-3PO rolled on stage as part of a tribute to legendary composer John Williams. And then got his photo with them. He also took photos with Star Wars' star Daisy Ridley, who plays Rey. He's still just a kid, but he knows how to charm women. Here's the compliment for actress Sofia Vergara. Tremblay high-fived Larson when she won the best actress award for Room and also shared a hug with her. 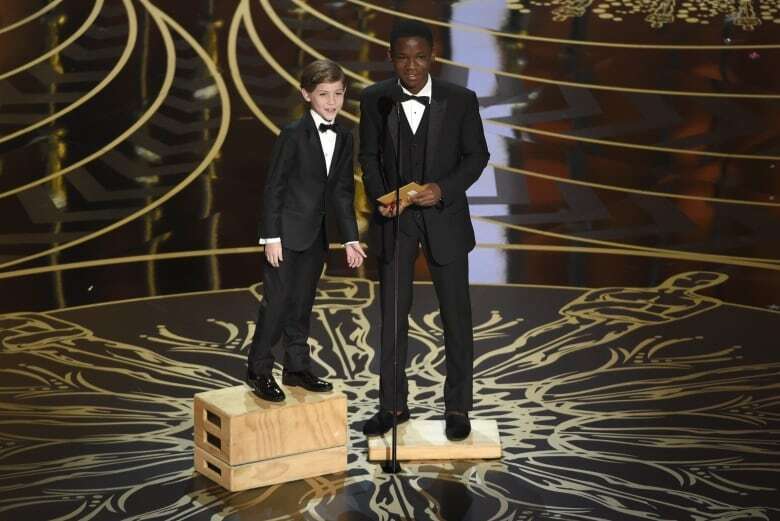 When host Chris Rock brought out the stool for Tremblay, the cute star told him he loved him in the animated film Madagascar. "He was the zebra. He's hilarious."